Although not actually born with a pencil in his hand, Peter said he did start screaming for one just as soon as he could fill his lungs. Apparently nobody seemed to understand and it was not until some years later that he was able to get hold of one. The opening of his first one man exhibition coincided with the day he started school and his picture of a cricket match, executed in coloured chalks on slate, was selected and hung on the classroom wall. He’s been putting things on walls ever since ..... shelves, clocks, emulsion paint and even the odd picture or two. Despite his love of drawing and painting Peter’s youthful ambition was actually to be a photographer. He trained in graphic arts, studied photographic processes and worked at a number of companies within the print/publishing industry. 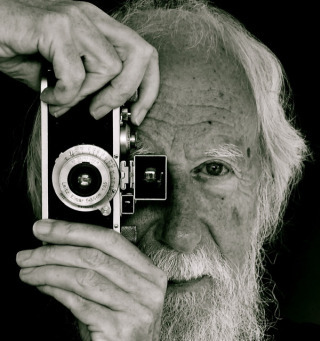 Lots of his photographs have been exhibited and used in books and magazines and he had his own well-equipped darkroom for many years. Attempting to lead a full life meant that he also played in a commercially very unsuccessful band, was a loss making small press publisher, a magazine editor, tried his hand at film making, museum design and display work, audio visual presentations and always enjoyed plenty of country walking. 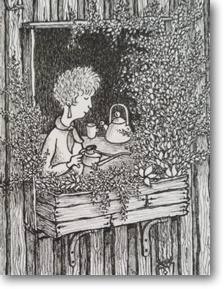 Inspired by the crazy contraptions of Heath Robinson and Rowland Emett, also the intriguing world of Edward Gorey, Peter was, regardless of whatever else he was doing at the time, always drawing or painting. His first published work was a page of cartoons about the Mini in a motoring magazine. After this success he decided that maybe he’d become a cartoonist but after bombarding editors with work and collecting enough reject slips from Punch to paper a room he began to have second thoughts. By 1986 he’d had quite enough of working for a living in any case and escaped to a freelance lifestyle which gave him more time to sit at his drawing board contemplating the clouds and listening to the radio. In fact he found a ready market for his semi-technical illustrations, pictorial maps and humorous pictures and was soon joined by his wife Ginny who created, produced and marketed their Steam Pencil range of handmade cards and still does the gardening. 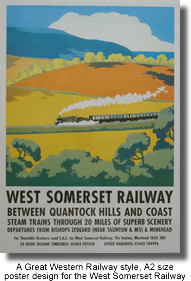 The transport theme, which gave him his first success, runs like a thread through much of his work whether it depicts bucolic byways such as the Portersfoote Bunting Light Railway in the mythical county of Whimshire or the massed commuters, gridlock and airport madness of the horrendous city of Barlam Gowling, an anagram of global warming. 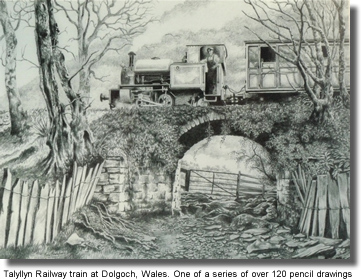 The later Gallimaufry series of black & white pictures also often has transport references within the strange hotchpotch world of the overall design where even the artist sometimes doesn’t know quite what’s going on! 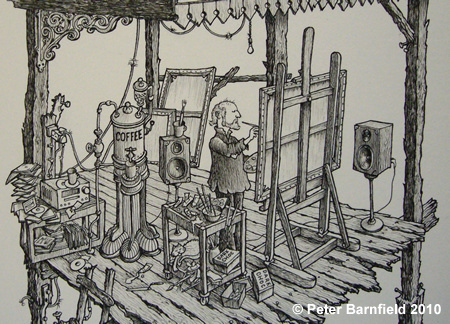 For a glimpse of this slightly surreal world visit the Black & White section in the Galleries.